The S.G.C. is put under quarantine after a mysterious infection leaves a Russian officer in the infirmary -- but the disease may not be a disease at all. 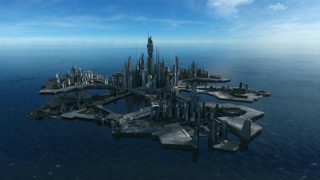 The climactic battle over Antarctica several months ago (“Lost City, Part 2”) is making things difficult for the Russians on the International Space Station, forced to adjust their flight path in order to avoid collision with debris from the destroyed Goa’uld ships. One sizeable chunk narrowly misses the station — but without anyone’s knowledge, something has managed to sneak aboard. One month later, Russian Colonel Alexi Vaselov is assigned to Stargate Command and pays a visit to General O’Neill. Jack is still settling into his new duties, and Vaselov shows his outstanding honors in the Russian military as proof that he is the right man to fill the gap on SG-1. O’Neill believes that the unit can continue as three and insists that, until Vaselov goes through proper training, he won’t even be allowed anywhere near the Stargate. O’Neill discusses the conversation with Vaselov with his former team, who all agree that there is no regulation that specifically states an S.G. unit must be made of at least four members. Daniel visits with Colonel Vaselov to encourage him to not take Jack’s decision personally, but midway through their discussion the Russian collapses. He is sent to Dr. Brightman’s care in the infirmary. The Colonel eventually awakens and informs her that he doesn’t recall anything since being in Russia. But he has lesions on over 40 percent of his body, and an elevated white blood count. Brightman suggests that anyone who has been in recent contact with Vaselov be examined immediately. Daniel, about to proceed off-world with SG-11, is surprised when O’Neill orders the gate shut down. After an order to report to the infirmary, Daniel snatches a weapon and holds its owner hostage, demanding that the gate be reactivated. He injures two S.F.’s before Teal’c takes him down with a zat gun, but even that is not enough until O’Neill shoots him in the arm. Following the incident, Brightman concludes that there is a high probability a contagion is sweeping the base. General O’Neill orders the S.G.C. under lockdown: no gate travel, and no one allowed in or out of the base. Daniel’s white blood count is dropping, and Vaselov’s condition is not improving. In his dreams he has begun to see flashes of the past few days, but feels like a helpless observer within his own body. He blames himself for the lockdown of the base and for Daniel’s condition, but Teal’c assures him that this would’ve happened wherever Vaselov would have been. But the manner in which Vaselov describes being trapped within his own body concerns Teal’c. Brightman and Carter learn that one of the Russian cosmonauts aboard the International Space Station died a week after returning to Russia, and that he exhibited the same symptoms as Vaselov. Vaselov was at his deathbed before traveling to the United States. Considering that no one else who was in contact with the cosmonaut became infected, it becomes less and less likely that this is a contagion at all. Daniel soon awakens and remembers nothing after reaching out to Vaselov when he collapsed. The possibility that an alien entity is jumping from person to person becomes highly plausible. Daniel has a memory flash of taking out one of the S.F.s in the Gate Room, and almost immediately comes to his own conclusion: the entity is Anubis. The base still in lockdown, Jack, Sam, and Teal’c deduce that the energy shield Anubis once used to contain his partially-ascended essence was destroyed along with his ship, but his essence itself survived along with debris from his ship until the proper time came to “hitch a ride” on the International Space Station. From the cosmonaut he entered Vaselov, then came to Stargate Command with the intent of escaping through the Stargate. He cannot use his powers as an ascended being to escape by less conventional means, as doing so would call down the judgment of the Ancients. Since anyone carrying Anubis’s essence experiences physical symptoms similar to fighting off an infection, O’Neill orders compulsory physicals for all base personnel. Vaselov held Anubis’ essence for more than a week, and Brightman says he is not responding to treatment. Unless circumstances change, he has at most two weeks to live. With this knowledge, Vaselov asks Daniel to deliver a personal letter to his sister. Daniel soon sees another memory flash, and realizes that Anubis left him for a nurse, Lieutenant Evans. She is questioned by Carter and declares she recalls nothing of the past Tuesday afternoon. Now Airman Malcolm McCaffrey is unaccounted for. McCaffrey takes out several airmen en route to the control room, and orders the Stargate to be dialed. O’Neill arrives and zats him, but almost immediately Anubis’ essence disappears through the Control Room wall. Dr. Jackson visits O’Neill’s office and proposes that, since they are unable to kill Anubis, they must find a way to goad him into using his Ancient abilities, thereby forcing the Ancient hierarchy to deal with him for violating their rules. To that end, he and Carter devise a means to divide the base into three separate sections, isolating personnel in each and dividing up food, medical resources, and control of power to the Stargate, making it impossible for Anubis to reach it via any one person and keeping him on the move through regular personnel examinations. Hopefully, once he realizes he can’t escape through the gate, Anubis will have no choice but to risk revealing himself to the Ancients. After six days without further incident, President Hayes orders O’Neill to recommence Stargate operations in 24 hours. With this in mind, O’Neill makes a last-ditch bluff with a base-wide announcement: the lockdown will continue indefinitely. Anubis, now more desperate, enters Lt. Colonel Carter and disables the division between quarantine zones with a sequence of timed commands. With base security compromised, O’Neill commences the self-destruct; but Carter, now free of Anubis, manages to abort it in time. Anubis manages to activate the Stargate — and he’s in O’Neill. Vaselov rushes into the Gate Room and tackles him, commandeering his weapon. He threatens Anubis that he will kill them both if he does not leave the General and take him instead. Anubis possesses Vaselov, and travels through the Stargate. Carter and Teal’c come to O’Neill’s aid, where Sam informs him that she couldn’t abort Anubis’ programmed dial-out — but she did manage to change the address. Anubis, in Vaselov’s body, is now frozen solid on an ice world. “The role of Colonel Alexi Vaselov was played by actor Gavin Hood who went on to win an Academy Award (no, not for his appearance on Stargate) in the Best Foreign Language Film category for Tsotsi, then later directed Rendition and X-Men Origins: Wolverine. More recently, Gavid Hood also directed the sci-fi film Ender’s Game. VOTE! How would you rate SG-1's "Lockdown?"